You can build almost anything with Legos—even controversy! The company came under fire this week for a licensed sticker set that includes a leering, waving male construction worker and the caption, "Hey Babe!" Journalist Josh Stearns set off a mini firestorm after spying the stickers in a store and calling out Lego on his Tumblr. "I was stunned … street harassment is the most prevalent form of sexual violence for both men and women in the United States," he writes. 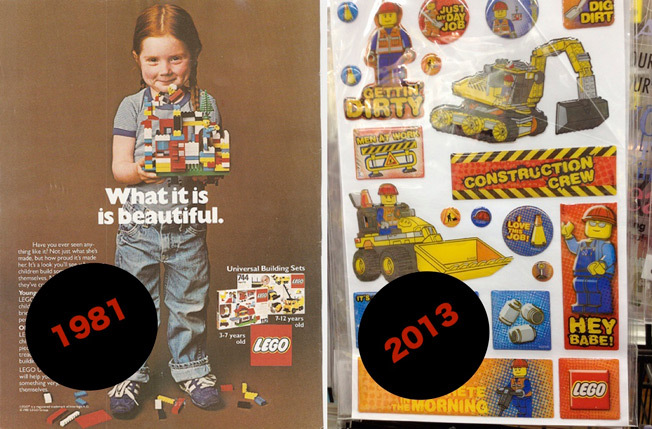 (He also pointed to a great Lego ad with a girl from 1981 to show "how far they have fallen" in their treatment of gender issues.) Some also noted that the stickers are exclusionary—no women on that crew—and generally portray construction workers as insensitive loafers. Lego initially responded by saying, "We firmly believe in the play experience we offer, a system that lends itself to years of unlimited play possibilities for any child. To communicate the Lego experience to children we typically use humor and we are sorry that you were unhappy with the way a minifigure was portrayed here." (The "humor" remark subsequently came under fire.) Turns out the product was discontinued in 2010, and the company that made it, Creative Imagination, tanked two years later. Ultimately, Lego told Stearns, "We would not approve such a product again." That's good news, and to its credit, Lego has built up plenty of goodwill through the years, particularly recently. Still, even before stickergate, the company was taking heat for reinforcing gender stereotypes, and they need to do more to counteract that or risk looking like a bunch of blockheads.